Tuesday November 1 sees one of the biggest races of the year and as usual, the Melbourne Cup is available for Korean viewers on the Australia Network. Coverage starts at 11am Korean Time and runs through until 1:30pm. The big race is at 1pm. The Australia Network is available on most Digital Cable and Satellite packages. For those without Digital Cable, the Australia Network can be viewed from within Korea free of charge on the English language website of the Donga-Ilbo Newspaper. Click Here to go straight to the feed. Should make for a better than usual Tuesday morning. Tough Win took it easy for a while and then cruised by the field to record possibly the simplest of what is now thirteen career wins from seventeen starts. Back at 1800 metres and escaping the handicapper’s weights for once in what was a rare Allowance feature race, the result was never likely to be in doubt. Nevertheless, Tough Win (Yonaguska) was still up against the likes of Larrycat (Fantasticat), who finished way ahead of him in the Grand Prix Stakes last year and the in-form Japanese pairing of Necromancer (Air Eminem) and KJ Khan (Squirtle Squirt). not to mention the old warhorse and former Grand Prix winner, Bally Brae (Yarrow Brae). Under Cho Kyoung Ho, Tough win sat at the back of the field around the first turn before moving into contention in the back-straight and easing clear as they turned for home. The margin at the end was eight lengths but it might as well have been eighteen. 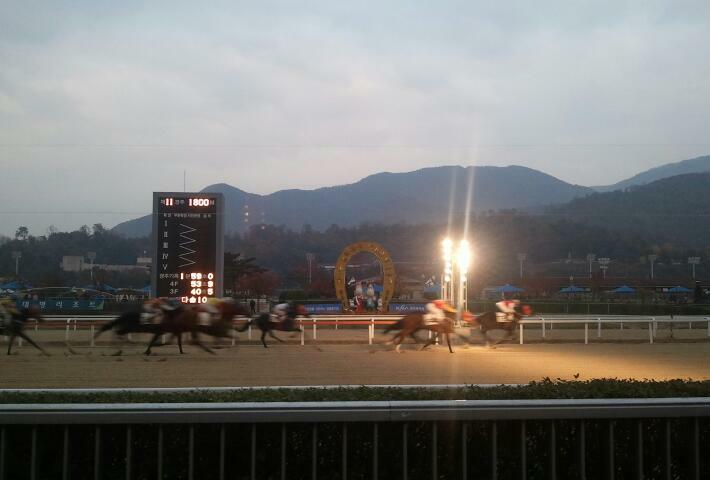 Tough Win is a horse that exposes both strengths and weaknesses of Korea racing. Ultimately he’s a sprinter but there are so few sprint races for Class 1 horses, he has had to be stretched out further. No problems there; he’s head and shoulders ahead of anything else on the peninsula up to nine furlongs. Above that, it gets tricky but the only Championship races for imported horses such as Tough Win are at 2000 Metres (Busan Metropolitan) and 2300 Metres (Grand Prix). Tough Win just about managed to win the Metropolitan last year but was soundly beaten this year as indeed he was in the Grand Prix. The Grand Prix is an Korean racing institution – racing fans get to vote on which horses should receive invitations and the result is that the best horses on the peninsula get in. It’s great. But it would be even better if we had both the Grand Prix Stakes and the Grand Prix Mile! 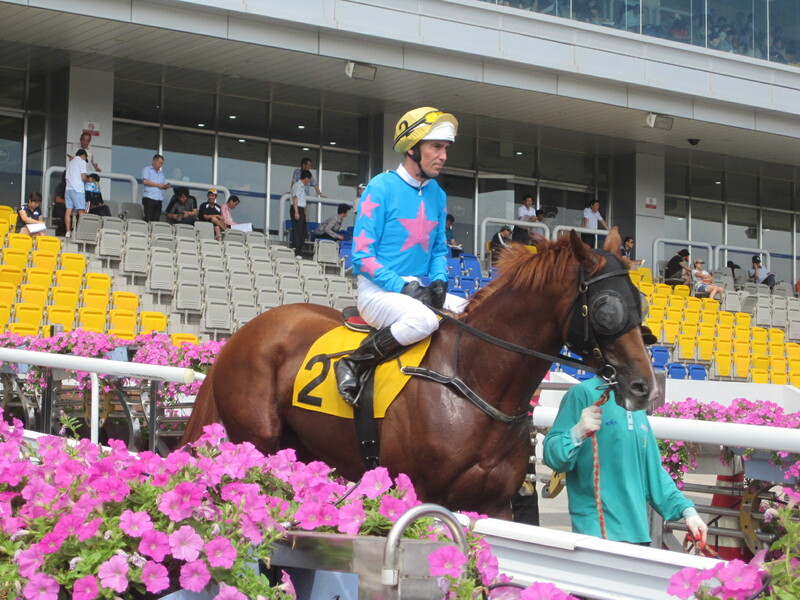 Down at Busan it was business as usual for Peter Wolsley and Nathan Stanley. 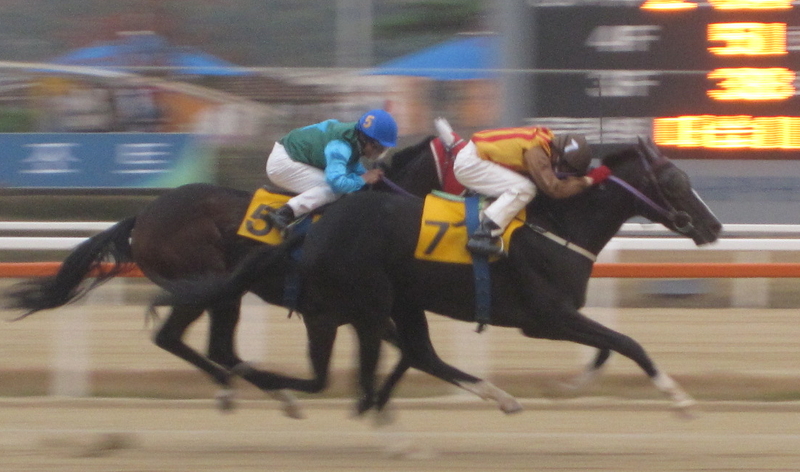 The Australian trainer/jockey duo combined to win the feature race with Gyeongkwaehanjilju (Tapit). The grey four-year old has now won his last three races and Wolsley and Stanley are undoubtedly the most lethal combination at the track. At least some Aussies are flying this weekend. In 2009 it was a fall, while in 2010 it was a lengthy suspension. 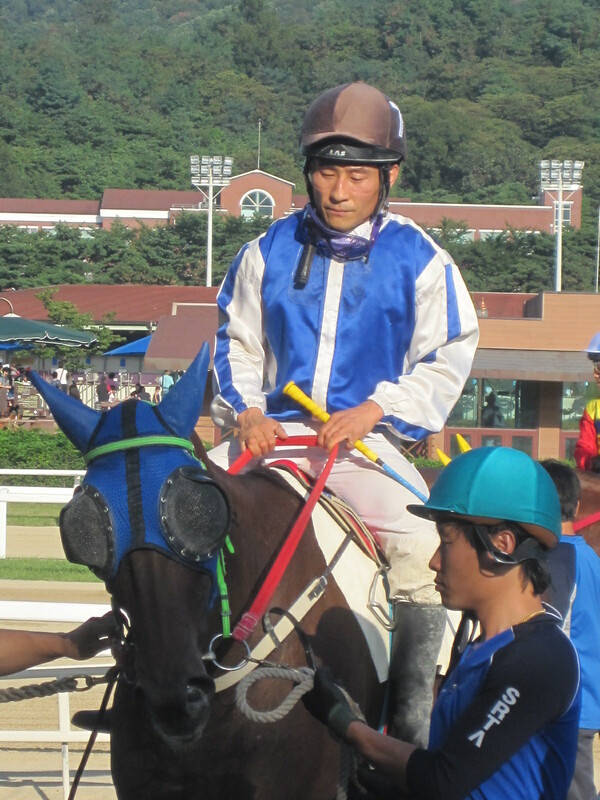 Bad luck and carelessness cost Moon Se Young the Seoul Jockeys’ Championship in the two years following his victory in 2008. It seems that it is only one of those two misfortunes that could possibly cost him this year’s crown as the 31-year-old cemented his commanding lead over rival Cho Kyoung Ho by riding four winners at Seoul Race Park this afternoon. Moon’s victories today were by no means routine. 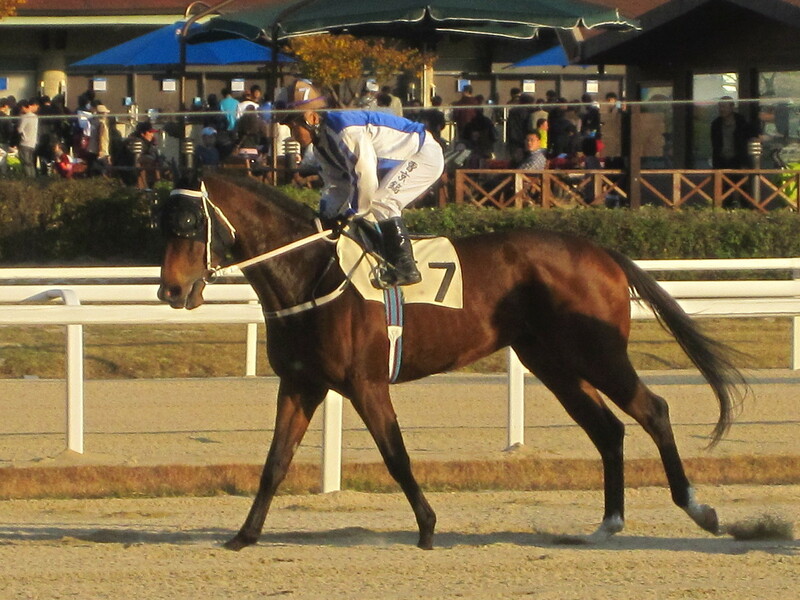 After taking race 1 on 7/1 shot Time Light (Revere) he immediately followed up in race 2 on Jeongsangillo (Flatter). After sitting out race 3 in he was back winning in race 4 by five lengths on 4/1 Jeongsang Yechan (Menifee). Not until race 8 did he ride a favourite and when he did, Magic Light (Exploit) duly obliged. It was a good day’s work but the Champion-elect still managed to look disgusted with himself after the last when Senchingu was beaten by slight favourite Bohemian Love (Commendable) ridden by his only serious rival for the title, Cho Kyoung Ho. Moon is now thirteen wins ahead of last year’s winner Cho with veteran Park Tae Jong a distant third. In other races, perennial underachiever Singgeureounachim (Exploit) finished on the right end of a quinella for once. The one-time Derby favourite has so far failed to live up to his substantial potential, however, today he made no mistake as, under Jo In Kwen, he took out the first of co-feature races. Starting even-money favourite, the three-year old collared early leader Gangcheoljangsa in the home straight and held on for a narrow victory. It was also a good day for the two Japanese jockeys at Seoul. After Makoto Noda won race 7 on Wangkkaebi (Fiercely), Mai Beppu followed up in race 11, the day’s second co-feature, by making all on Mass Media’s Tea (Mass Media) to score victory by a length. Noda and Beppu move on to six and eight wins in Korea respectively. 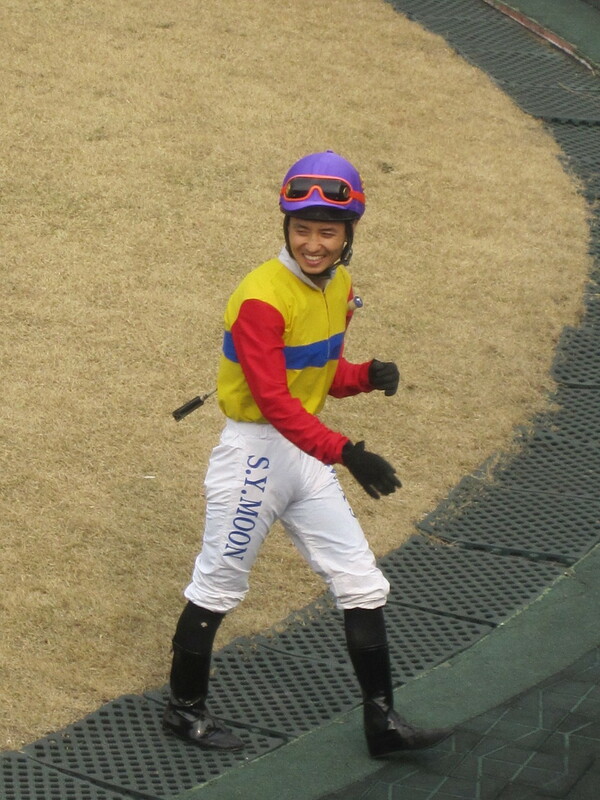 While on the subject of jockeys, a word for Park Sang Woo. With the horses in the gate for race 9, his mount Honggwang reared up violently throwing him off and jamming his leg against the metal stall in the process. Unable to move, he had to be carried out towards the waiting ambulance. However, with Honggwang unharmed and to a round of applause, he insisted upon being placed back on the horse. Brave, stupid or both it may have been from Park and Honggwang, a 25/1 outsider, ran to form and finished nowhere. On returning to scale, Park collapsed after dismounting, his leg giving way, and had to be carried to weigh in. He did his job. Jockeys are tough. We had the first icy blasts of winter across the Korean peninsula earlier this week. However, while Trackwork can’t have been much fun on Tuesday and Wednesday mornings as temperatures neared freezing point for the first time since March, things are looking good for a glorious weekend. Except for the ponies on Jeju, there’s no Stakes action in Korea this weekend as we build up to next week’s President’s Cup, however, there’s still an awful lot to keep us entertained. After missing the KRA Cup Classic three weeks ago, Tough Win (Yonaguska) returns to action at Seoul on Sunday. His match-up with Larrycat (Fantasticat) in the feature race provides the weekend highlight. Joining them will be former Grand Prix winner and track legend Bally Brae (Yarrow Brae) in the nine furlong test. Also in action on Sunday will be ever-improving filly Raon Speed Tapit) as she takes on the formidable Balhaemyeongjang (Champali) and the old stager Good Day (Double Honor) in the second of co-features. We’ll have our eye on Busan for the return of Japanese jockey Eiki Nishimura while Aussie rider Nathan Stanley has his usual array of good chances for Peter Wolsley. Busan’s feature race of the weekend comes on Sunday when Golding (Gold Alert) and Admiral Reigart (General Royal) – both of whom have been stalwarts of the track since it opened in 2005 will come up against each other for the umpteenth time. It’s Stanley and Wolsley who could have the edge though, as they seek a third consecutive win for colt Gyeongkwaehanjilju (Tapit) while young upstart Bello Road (Irish Road) makes his class 1 debut. Japanese jockey Eiki Nishimura is coming back to Busan this weekend on a short-term license after nearly two years away from Korean racing. The 36 year old is best remembered in Korea for winning the KRA Cup Mile – the first leg of the Korean Triple Crown – on the champion filly Sangseung Ilro in 2009. In all, Eiki rode 48 winners from 392 rides in his first spell at Busan. He started slowly but made his breakthrough as the regular rider of Sangseung Ilro culminating in her Cup Mile win in April 2009. However, he was mysteriously jocked off the filly for her successful run in the Korean Derby the following month. Although no-one went record about it (apart from Eiki himself on his Japanese blog at the time), the feeling was that local riders at Busan had been angry about a foreign jockey winning the track’s biggest race of the year. The Jockey Union at Seoul who at the time opposed any foreign involvement in Korean racing were determined this would not happen in the Derby and pressure was applied. Eiki persevered although he found his opportunities limited before he returned to his home track of Arao in late 2009. An affable and friendly character, he invited Korean jockey Park Jae Ho across to Japan to gain some experience. Things at Busan are a little different now. After the shockingly bad treatment another Japanese rider, Hitomi Miyahshita received at the hands of the Jockey Union in the aftermath of Park Jin Hee’s death in early 2010, the locals have had another dose of Toshio Uchida winning races and recently of Akane Yamamoto and Australian Nathan Stanley winning Stakes races. As younger Korean jockeys come through, the foreign riders are gradually becoming more accepted and Eiki’s most welcome return is at exactly the right time. Nishimura has nine rides at Busan across this weekend starting in race 1 on Friday when he’ll be riding for American trainer Joe Murphy. Nathan Stanley has twelve rides on Friday and Sunday most for Peter Wolsley. Akane Yamamoto sits out this week to serve a two-day suspension. Whatever happens on the track at Churchill Downs next week, there’s a high chance that one or more of the horses taking part in the 2011 Breeders’ Cup may one day end up plying their trade as a stallion in Korea. If they do, they’ll find themselves alongside the horse who holds the record for the biggest margin of victory in the biggest race of them all; 2002 Breeders’ Cup Classic Winner Volponi. He was an unlikely champion. As a two-year old, Volponi [Cryptoclearance-Prom Knight (Sir Harry Lewis)] had won the Pilgrim Stakes at New York’s Belmont Park and at three claimed victory in Monmouth Park’s Pegasus Stakes. Back at Belmont in June 2002 he won the Poker Stakes. With those three Stakes wins under his belt, the now four-year old Volponi was undoubtedly a good horse but there was little to suggest he would pose much of a threat to a Classic field that included the Kentucky Derby and Preakness Stakes winner War Emblem as well as the punters’ favourite Medaglia d’Oro. Accordingly, Volponi was sent off at 43/1 – the longest shot on the board. What happened next on that day at Arlington Park is well-known. War Emblem had left his racing form in the early part of the season and while showing at the front early was never a threat. Meanwhile Volponi, under Jose Santos, hit the front as they turned for home and sprinted away in the stretch to record a six and a half-length victory from Medaglia d’Oro in second and Milwaukee Brew in third. It was a stunning performance, one that set a record winning margin that is yet to be beaten, exposed a betting scam and also set the wheels in motion for Volponi’s future life. The horse would appear eight times as a five-year old in 2003, regularly placing but he couldn’t add to his win total and he was retired to Stud at the end of the year. His initial performance as a stallion was not encouraging and in 2005, an offer from the Korea Racing Authority (KRA) was accepted and Volponi was on his way to the Korean Peninsula. Volponi is perhaps not the kind of stallion the KRA would be buying today. However, in 2005 the market was very different to the one in recent years which has allowed Korea to purchase more established producers such as Menifee, Vicar, Ecton Park and Officer. In 2005, the leading sire in Korea was by far and away Concept Win (Manila), ahead of Ft. Stockton (Cure The Blues) and Fiercely (Danzig). These had been around for quite some time along with the likes of Revere (Dancing Brave), Lost Mountain (Cox’s Ridge), Psychobabble (Caerleon) and Didyme (Dixieland Band). With the opening of the Busan Racecourse and subsequent substantial increase in the number of thoroughbred races run in the country, new blood – literally – was needed in the Stallion ranks and a Breeders’ Cup Classic winner was hard to turn down. Fast forward to 2011 and Volponi has now been in Korea for six years with three crops hitting the track. In 2009, he was leading first-crop sire ahead of fellow debutants Yankee Victor (now sadly deceased) and the Japanese Biwa Shinseiki. With his first three-year olds in 2010 he finished ninth in the Leading General Sire list. Currently he is in seventh place for 2011 (there’s little to choose between Vicar, Menifee and Exploit at the top). While Medaglia d”Oro, the horse he beat in 2002, is most famous for siring the great Rachel Alexandra, so Volponi’s greatest successes have also come with fillies. 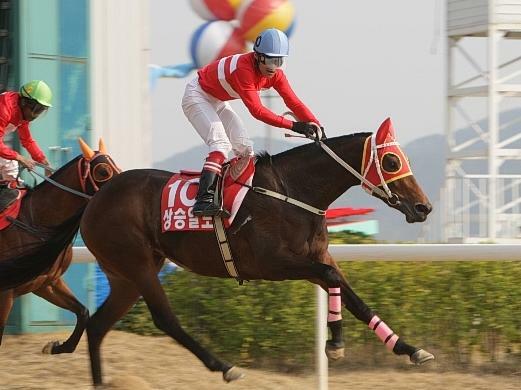 Dongbang Rose was third in the 2010 Korean Oaks and went on to win the NACF Chairman’s Stakes later that year. Meanwhile, the otherwise undistinguished Crown Flag somehow managed to score a win in the Busan Ilbo Stakes earlier this year. The cheekily named filly Special Volpony has also reached class 1 racing level. This year, the new guard of stallions have been siring the Classic winners. While little known Japanese import Meisei Opera was responsible for KRA Cup Mile (Korean Guineas) winner Soseuldeamun, the other two legs of the Triple Crown were won by Gwangyajeil (Korean Derby) and Dongseo Jeongbeol (Minister’s Cup), both by Vicar. Meanwhile Oaks winner Useung Touch is by Menifee. Exploit has the most runners of all sires in Korea right now and accordingly generates a lot of earnings. Soon to come on stream will be runners by Ecton Park who is standing privately for Isidore Farm on Jeju Island and the KRA’s Forest Camp. Still further in the future, there is Officer and Whywhywhy to look forward to. However, although efforts are underway to strongly promote domestic sires, we are still some way from having a successful Korean born sire. Long-term, the authorities hope the progeny of one of these new imports will be the one to make the breakthrough. 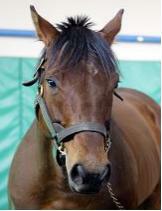 Volponi continues to be well visited, covering 77 mares in 2011. Although he was based at the KRA Stud Farm on Jeju Island for most of his first five years in Korea, he was moved earlier this year to the KRA’s Jangsu Farm in North Jeolla Province after his ownership transferred to the Korean Mainland Horse Breeders’ Association. He leaves behind on Jeju a horse he had met before; Hawk Wing (Woodman) was among those trailing him home at Arlington and arrived in Korea in 2008. The racing world is a small one. Volponi’s Korean Studbook Entry – Contrary to popular belief on some internet forums, Stallions are not routinely slaughtered here – the English langauge Studbook enables anyone anywhere to track the progress of any horse in Korea. * This post is part of a series of posts building up to the 2011 Breeders’ Cup by members of TURF – an International Gathering of Horse Racing Bloggers of which Horse Racing in Korea is a member. Things just keep getting better on the track for Peter Wolsley and Nathan Stanley. The Australian trainer and jockey duo recorded another big win at Busan this afternoon as Secret Whisper took victory in the Macau Jockey Club Trophy by the narrowest of noses. Sent off as second favourite, Stanley and Secret Whisper sat towards the back of the field in the early stages of the 1400 metre race as punters’ choice Jeonseong Sidae made the early running. There was still plenty to do when Stanley made his move entering the home straight finding one route and then another blocked off by traffic. It wasn’t until deep inside the final furlong that Secret Whisper had daylight in front of her and she swept past Jeonseong Sidae just before the line. One of five fillies among the fourteen strong field, the Pegasus Farm owned Secret Whisper now has five wins from her eleven starts. Although officially classed as a “Featured” rather than “Stakes” race, in terms of prize money, the MJC Trophy is still a big one and it continued the remarkable run of success that Peter Wolsley and Nathan Stanley have been enjoying of late. For Wolsley it has been a long hard slog in the barn since arriving in Korea three years ago to reach his current position as one of the top four trainers at Busan. On the contrary for Stanley, success has been instantaneous. Since getting an unexpected bonus on his first day when he picked up the ride on Khaosan, who would go onto win the Owners’ Cup, it has been winner after winner. With a win rate of nearly 25%, punters have started to look out for him. No doubt the local jockeys will be doing exactly the same. They should; his ride on Secret Whisper today was both resourceful and well judged. Up at Seoul the fillies were in Stakes action in the Gyeonggi Governor’s Cup and it was three-year old Seingniuihamseong, fifth in the Korean Oaks in August who took the honours. Last but one entering the home straight, Moon Se Young guided the 5.1 second favourite through the pack to hit the front with just metres to spare to win by just under a length. A word too for apprentice jockey Lee Hyeok. In race 3 at Seoul today, he won for the very first time as he partnered 9/1 Damas Ruler to victory. An hour later he was back in the winner’s circle with Exciting Runner after race 5. With his two wins today it means that all three of this year’s new jockeys are off the mark – Lee is one winner behind Lee Ah Na and Seo Seung Un who both have three. All three look very competent. Ultimately good jockeys matter. At Busan, a bout of sickness aside, Nathan Stanley had already proven he was lucky. Today he proved he’s pretty good too. It’s great news for Korean racing.